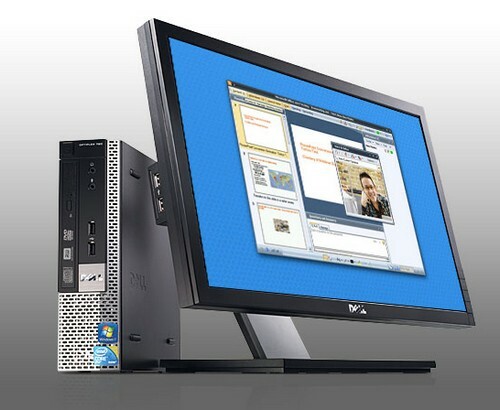 Of course there’s no optical drive or monitor, but with most workplace installs done over a network and monitors chip as chips, well almost, the 19 inch Dell E190S will set you back $169, for a touch over $800 you get yourself a corporate desktop. As usual with Dell PCs you can ramp the base Optiplex 780 up a touch with a Intel Core 2 Duo E7500 (2.93GHz) powered unit with 2 GB memory, 320 GB HDD and 8X DVD+/-RW SATA optical drive costing $902. Not bad if you’re looking for something compact for your office workstations.